B-29 Superfortresses of the 20th Air Force, 314th Bomb Wing, 19th Bomb Group commanded by US Army Air Forces General Thomas Sarsfield Power unload M-69 incendiaries on Yokohama. The 314th Wing began operations from Guam in February 1945. 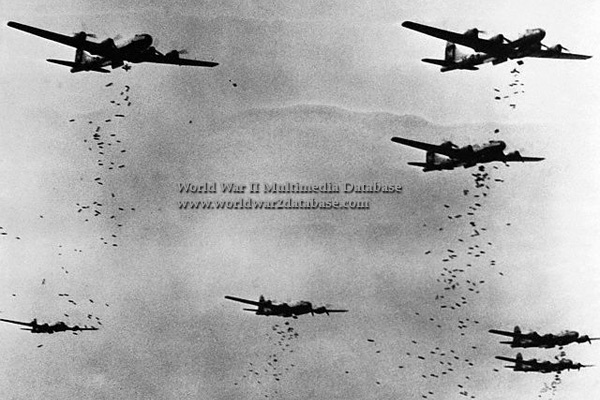 It consisted of the 19th, 29th, 39th and 330th Bomb Groups. Between May-September 1943, Standard Oil built mock Japanese villages at Dugway Proving Ground in Utah for the US Army's Chemical Corps and bombed them with incendiaries to test their flammability. RKO Studios furnished the villages with tatami mats and paper screens. The tests showed that coprecipitated aluminum salts of naphthenic and palmitic acids (napalm) mixed with gasoline, caused Japanese buildings to burn very fast. The M-69, developed in 1942 by Harvard scientists, was only six pounds (2.7 kilograms) bundled together in 500-pound (226.8 kilogram) clusters. It did not have the tail fins used for stabilization on other bombs. The steel container, about 3 inches (7.6 centimeters) in diameter and 20 inches (50 centimeters) long, looked more like an elongated tin can than a bomb. When the cluster left the bomb bay, the M-69 broke free and released a streamer that caught the wind and scattered the bombs. A delay fuse allowed the M-69 to penetrate roofs and spread burning gasoline 100 feet (30 meters). Each B-29 carried seven to eight tons, scores of clusters, 3000 miles (4800 kilometers) to Japan from bases in the Marianas. Antipersonnel bombs were mixed in to eliminate Japanese firefighters. Both Curtis LeMay and Robert MacNamara said that if the United States lost the war, firebombing would have been classified as a war crime. Nine square miles (23.3 square kilometers) of Yokohama were completely destroyed in firebombing. Crew of B-29 Superfortress "Sentimental Journey"